Upon hearing that Disney was creating a live-action version of its animated Beauty and the Beast musical, my first thought was: What will composer Alan Menken do differently than he has already done in the now-classic 1991 original (which won him Oscars for song and score) or the 1994 Broadway stage version (which earned Tony nominations for best musical and score)? For this story in the current issue of Variety, I interviewed Menken, Disney music executive Mitchell Leib, and music supervisor Matt Sullivan for a behind-the-scenes look at the film’s new songs and the somewhat darker, more emotional dramatic score. This entry was posted in Composers, Film Music, Interviews and tagged Alan Menken, Beauty and the Beast, Disney musicals, Disney's Beauty and the Beast, live action Beauty and the Beast, Matt Sullivan, Mitchell Leib, Variety on March 15, 2017 by Jon Burlingame. Will “La La Land” mean more new screen musicals? 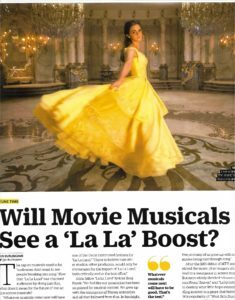 Perhaps the most interesting of my post-Oscar-nomination assignments: The editors at Variety posed this question: Will the success of La La Land result in studios — which have been reluctant to green-light musicals without a built-in audience — starting to take risks again on original concepts that happen to include actors breaking into song? 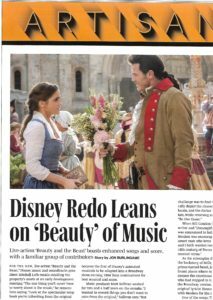 I interviewed composers, songwriters, agents and others involved in La La Land, Mary Poppins Returns, and the upcoming Beauty and the Beast, for the story in this week’s Variety Contenders music issue. Many of them were enthusiastic about the future. This entry was posted in Composers, Film Music, Interviews and tagged Beauty and the Beast, La La Land, Mary Poppins Returns, movie musicals, music Oscar nominees, Oscar-nominated musical, screen musicals, Variety on February 10, 2017 by Jon Burlingame.